Efforts in evaluating the potential of banana shrimp Fenneropenaeus mergueinsis as an alternate species for diversification, has been handicapped by the difficulties in procuring broodstock to produce seed and no commercial hatchery is ready to supply banana shrimp seed. 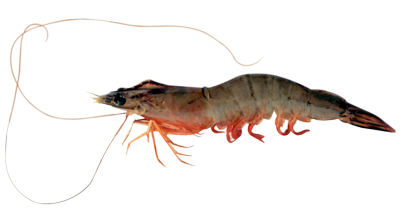 During the period from March 2009 to April 2010, with the objective of identifying broodstock sources of banana shrimp in Tamil Nadu coastal area, an extensive enquiry was conducted with fishermen, and Gulf of Mannar was identified. Five field trips were undertaken to the fishing village zone from Adiramapattinam to Mallipattinam and 458 live adult shrimps were collected. The females were heavier (140 -180mm; 35 - 55 g) compared to males (130 -155mm; 15 - 25 g) and in all five collections, the number of males was considerably low (5.51 - 20.30 %).